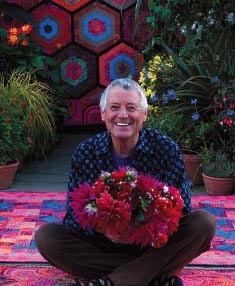 Kaffe Fassett coming to Chattanooga. World renowned fiber artist and designer, Kaffe Fassett, is coming to Chattanooga for an inspirational slideshow and talk, kicking off a week of workshops about using color in design. For more than 40 years, Kaffe has taught his workshop and slideshow series around the world. He is author of 15 books on knitting, quilting, needlework and design. Victoria and Albert Museum’s one man show for Kaffe broke attendance recrods. Kaffe’s quilts, knitwear, needlepoints, paintings and mosaics are collected internationally. An Evening with Kaffe Fassett, a slide show and talk, will be on Tuesday evening, October 18, at 7 pm at Frierson Auditorium at Girls Preparatory School. Workshops include a one day workshop, “Kaffe’s Color Method,” taught by Erin Lee Gafill, California artist and Kaffe’s niece on October 18 at Loose Cannon Gallery. One-day and two-day Color in Design knitting, quilting and painting workshops take place October 19, 20 and October 24, 25 in Chattanooga for artists and craftspeople of all skill levels and mediums. For tickets or more info: www.bigsurarts.com/kaffe or call (831) 646-9000. Hey Veronica! I just wanted to say thank you for the heads-up on this event; I just got tickets for myself and a friend to come hear Kaffe speak. Very exciting! Hope you're doing well, and I hope to see you that night! It should be a great show. See you there! Wear your textile finery.